If you’ve used iPhoto to watch a slideshow, you probably know you can switch from automatic playback to manual mode by pressing the Space Bar. However, in manual mode, iPhoto places a semi-transparent slideshow controller on the screen. The controller provides quick mouse access for three functions: jump back one slide, switch back to play mode, and jump forward one slide. However, there are keyboard shortcuts for each of these—the left arrow key, the space bar, and the right arrow key, respectively, so the onscreen controller isn’t needed if you use the keyboard; all it does is cover up some of your glorious pictures of Uncle Jim and Aunt Jane. Here’s one way to disable the onscreen controller without breaking the slideshow functionality. First, quit iPhoto if it’s running. You should also make sure you have a current backup, just in case things go horribly wrong—although this hint is generally harmless, you will be modifying files within the iPhoto application bundle. After you’re sure you have a good backup, control-click on iPhoto in the /Applications folder, and pick Show Package Contents from the pop-up menu. 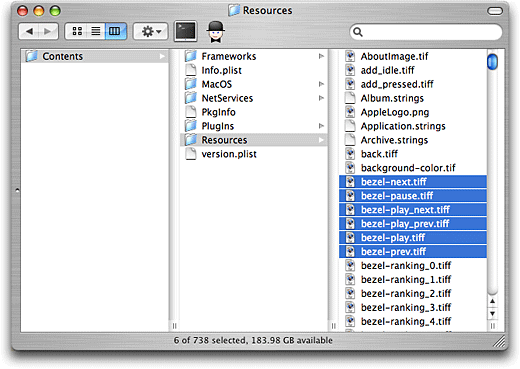 In the new window that opens, navigate into Contents -> Resources. There are six files we’re interested in, as seen the screenshot below. So instead of removing the files, we’ll just make the images 100-percent transparent. This is easily done with any member of the Photoshop family— Elements, CS2, CS3, etc., and it may also be possible with GraphicConverter or other graphic editors. Open each file shown above, make sure the Layers window is visible, and then set the opacity of the layer to 0 percent and save the file (keeping it as a TIFF). Repeat for each of these files, saving your changes for each. When you’re done, launch iPhoto and start a slideshow. Switch to manual mode, and you’ll notice (or not notice) that the controller is no longer visible. Another alternative may be to simply substitute your own fully transparent TIFF images, though I haven’t tried that approach. To restore the controller, should you ever want it back, there are two solutions. Either copy the six files from your backup (you made one, right? ), or you could open each image in Photoshop and set its opacity back to 100 percent. Personally, I find the first solution much simpler. And hopefully, Apple will someday give us the ability to really disable the onscreen controller—there’s a checkbox to apparently disable it in the Slideshow settings panel, but that setting is ignored when you’re in manual slideshow mode.